The World According to Mrs B: Spring, oh where have you gone? Spring, oh where have you gone? Mea maxima culpa for not blogging, even though I did promise to. No rest for the wicked alas. Life just got in the way of, well, everything. - the drainage system we had put in works like a treat. It has astounded us a couple of times already. Hard earned money well spent. No more flooding in the direct vicinity around the house. - we bought two chickens for Crazy Neighbour because his four chickens weren't laying eggs as they were supposed to. Alas a couple of days later they were all slaughtered by a fox. A week later his new chickens were also killed, he found them neatly stacked next to the enclosure. We lent him some netting and rope for electrifying meadows. The chicken coop now looks like some sort of friendly concentration camp. The fox has not returned so far. 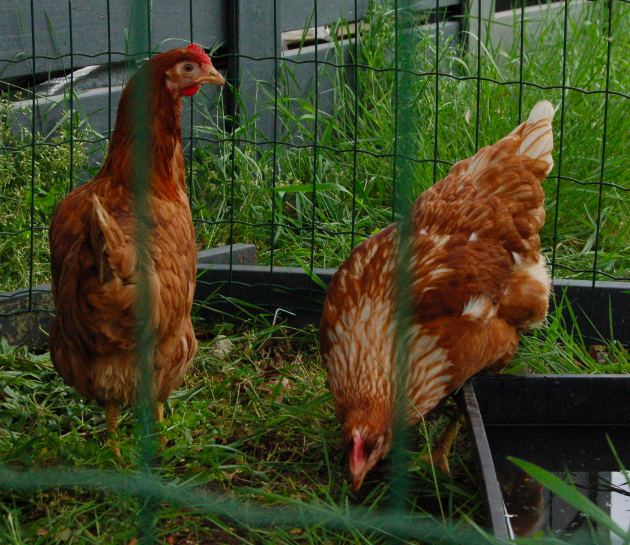 Here's a snap of the two beautiful chicks that are no longer. - Dr Livingstone sowed the meadow but it didn't really kick off growing, for lack of water, even though we sprayed it daily. Thanks to a few heavy showers, it has finally started growing. We've even put on some manure and it looks like it is working. Our nice neighbour (not the Crazy One, the other one) has one of those lawn mowers you can sit on. He surprised us the other week by having mowed the entire meadow! Lovely geezer. We awarded him with an Iron Maiden Trooper Beer. - our greenhouse has been spared the bombardment of the Hail Stones of Death that came down in several parts of Belgium last week. We had been a bit anxious and Dr Livingstone had devised a diabolical plan to counter this. Putting inflated air matrasses on top of the construction. In my honest opinion they wouldn't last five minutes, wind gusts were so severe, they would have ended up in Crazy Neighbour's pond anyway. 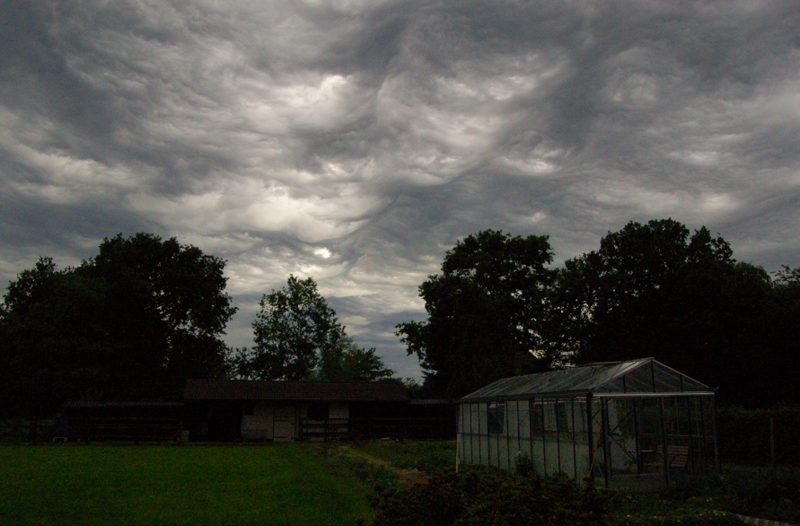 We did sit out in the garden awaiting a brief storm on the 9th and I managed to capture some very rare Altostratus undulatus asperatus. 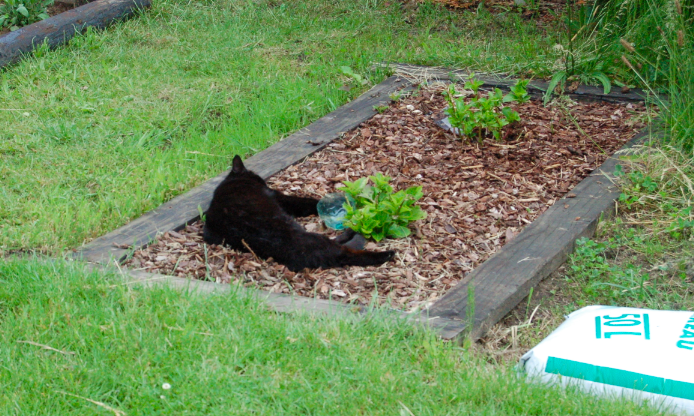 I will leave you with a picture of Mouser who has taken the not unseemly task to hand paw to guard the hortensias. As you can see it is extremely exhausting work and I'm not sure how long Kitteh with actually last under the heavy burden.